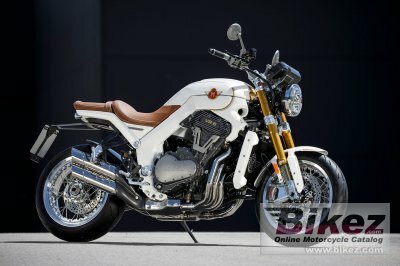 2018 Horex VR6 Classic. Picture credits - Horex. Submit more pictures. The new HOREX VR6 Classic is the serial model following on the unveiling of the exclusive special model HOREX VR6 Silver Edition. The HOREX VR6 serial models are extraordinary feats of technical prowess in their own right and crafted with a quality characteristic of an exclusive, small-run series designed to make a statement. Price as new (MSRP): Euro 38500. Prices depend on country, taxes, accessories, etc. Ask questions Join the 18 Horex VR6 Classic discussion group or the general Horex discussion group. Bikez has discussion forums for every bike. View comments, questions and answers at the 2018 Horex VR6 Classic discussion group. You can sign up for e-mail notifications when other riders answer you. If you have extensive experience with the MC, please send us a review. If you consider buying this bike, you should view the list of related motorbikes Look at photos. Compare technical specs. And check out the rating of the bike's engine performance, reliability, repair costs, etc. You can compare the rating with other bikes.